Soak rice and yellow pigeon peas in water for about 30-40 minutes. If you don't have time then you can use it immediately also. Soaked dal takes less time to cook. Take a pan and heat ghee. Add mustard seeds, cumin seeds, cloves, cinnamon, curry leaves asafoetida and onions. Saute it for about a minute, add green chillies and 3 glasses of water. Let the water boil. Add salt, turmeric powder and rice and pigeon peas. Close the lid and cook it for about 20 minutes or till it is done. You can even cook in pressure cooker, pressure cook for 2 whistles and let it cool. 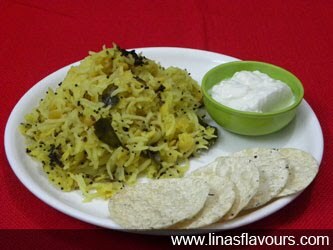 Serve it with curd, papadums, curry or Gujarati Kadhi.